Home Crochet Wool Needles, Where Have You Been All My Life? So, I’ve been ordering virtually everything I could find on Amazon designed for this purpose. It’s literally taken months for all of them to get here – mostly because I ordered them one at a time. 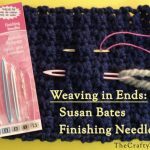 I’ve tried a variety of hand-sewing needles, the Susan Bates Finishing Needles and the Clover Darning Needles with Latch Hook Eyes. One of them is a maybe; I wish I didn’t buy the other and the hand-sewing needles I had. 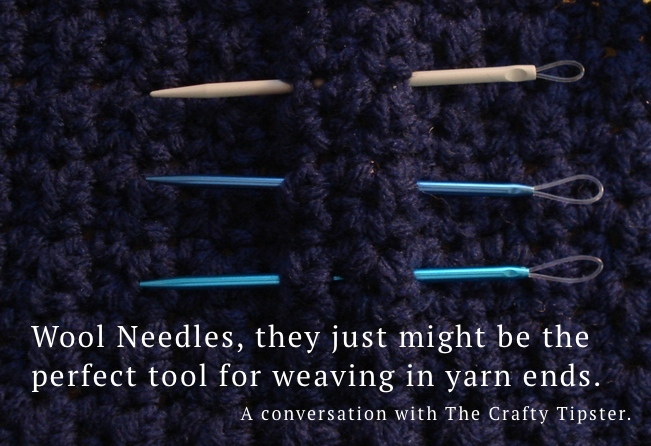 However, for fine yarns and crochet thread, my go-to is still probably going to be sewing needles. But, for everything else, it’s wool needles all the way. There appear to be three brands being sold, at least on Amazon, and one by one, I’ve bought them all. Two came from England and one was an Amazon stock item. The picture above shows the largest needle included in each package. I was able to purchase all three of them for less than $20. And, when I ordered them (and when I wrote this review 2/3/18) they were shipped for free. Wool Needles, the bomb-diggity of inventions! The shafts of the needles are made of aluminum. One end is pointed and the other end has a little nylon loop. It is this loop that makes the magic happen. 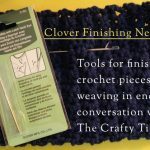 You thread the yarn or crochet thread through the nylon loop like you would a regular sewing needle. 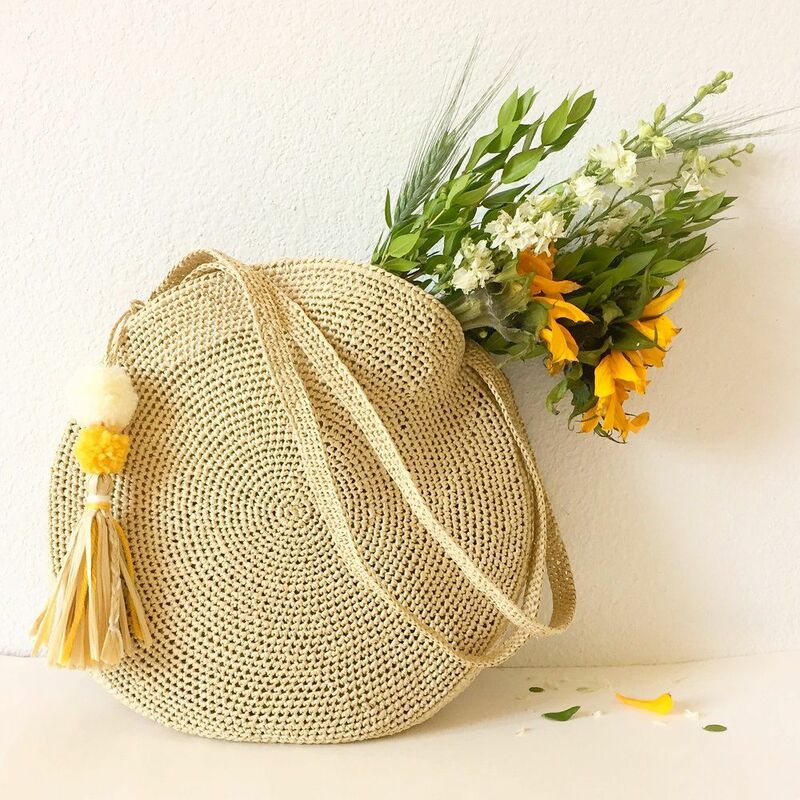 But, when you pull the needle through your crochet piece, the nylon loop collapses around the yarn and easily slides through even the tightest of stitches. 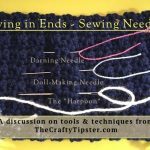 Basically, if you can get the tip and shaft of the needle through the stitch the working end will slip through easily. It can require a little twirling or moisture to get the fibers through the nylon eye but I’ve done so much embroidery through the years that I’m sorta used to doing that. My biggest concern with wool needles is that one wrong tug and the nylon will slip out of the aluminum shaft. I treat them gently and try to place the needle differently rather than tug too much. All seem to be holding up fine. I wish they were slightly shorter but for, the most part, when I have really short ends, I just weave the needle into place and then lasso the end. The first ones I ordered came from England. It took a few weeks for them to arrive. And, once they got here I could not believe how cool they were. They make weaving in ends almost fun. Yes, I did say that. 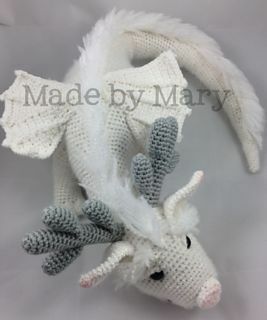 These were my first, but, I am so glad they weren’t the last wool needles I tried. They’re made in India and sold on Amazon by a British company. They came with three different sizes; all with the same color shaft. The material these are made with feels a little funny. They are metal but they do look a bit like plastic. I guess they just doesn’t have the shiny, colorful finish most aluminum crochet hooks have. Unfortunately, when traveling through the yarn, they remind me of plastic crochet hooks – they tend to sorta stick to the yarn. They don’t actually snag but it’s not as smooth as I would prefer. It’s hard to see the difference in size between them but the eyes are slightly different sizes. My biggest disappointment with these wool needles is the tips. The tips on these are a little square and blunt. Not so much so that they snag but enough where they don’t always slip in between the strands of crochet thread. I purchased these from one of the Amazon 3rd party vendors – Quilted Bear Ltd from England. The Pony Wool Needles came in a little cardboard folio designed for storing the set. They have tons of wonderful sewing, crochet and craft tools; many of which don’t appear to be available in the US. 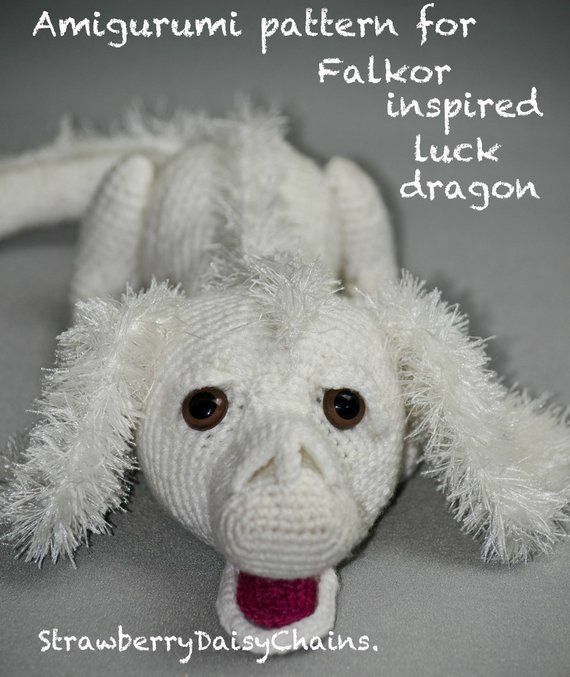 Follow this link to check out the Pony Wool Needles. These also came three to a pack. The size difference of the needles is noticeable. Oddly enough, it appears the smallest-sized needle has the largest loop. All three needles have larger loops than the Pony needles. The largest Knitter’s Pride wool needle is about 4.5 inches or 10cm long from the tip to the end of the loop. The medium is 3.25 inches or 8.5 cm. The small is 3 inches or just under 8cm. 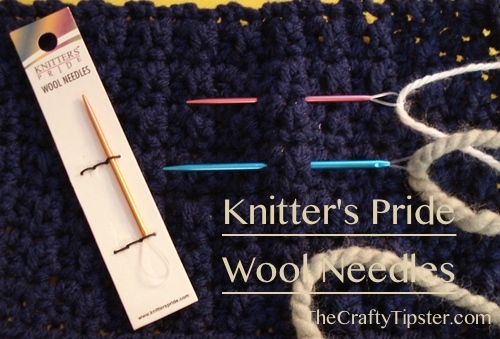 The medium and small-sized wool needles from Knitter’s Pride have thinner shafts than the Pony’s. The tips are smaller but unfortunately, they are also “blunts.” In fact, they mention on the back of the package, “Blunt ends to avoid injury while sewing knitted projects.” For me, they are a little too blunt. Sometimes it seems like they push finer yarns rather than sliding between them. They don’t snag per se, but they are sometimes a bit frustrating to use. Don’t you just love the part about untrained/unfamiliar person? Is there formal training in England for using blunt-tipped sewing needles? Does one require additional training to graduate to sharp-tipped needles? And, oh heavens, perish the thought of using needle-tipped embroidery scissors. Might need a license for those. Sorry, couldn’t resist poking fun of the safety warnings. The needles are color-coded. The original packaging has little elastic bands that secure the needles to the cardboard. Makes it nice for keeping them together. They were an Amazon stock item sold by the third party vendor GR Products. You can find them here. They sell a few other Knitter’s Pride knitting tools as well as a variety of other arts, crafts and novelty items. The Prym Wool Needles look a lot like the Knitter’s Pride Wool Needles – they came in three distinct sizes, in three different colors. The Prym Wool Needles appear to have used a slightly thinner nylon for their loops. They are made in India for the German company Prym. The Prym Wool Needles cam in a blister pack. The package has one of those perforated backs but I found it impossible to open without ruining the closure. Clearly, they have the least user-friendly packaging of the three brands but I wouldn’t really hold that against them. To me, these are truly the best of the wool needles for weaving in crocheted ends. 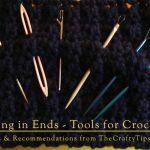 I would recommend them for every crocheter and knitter. 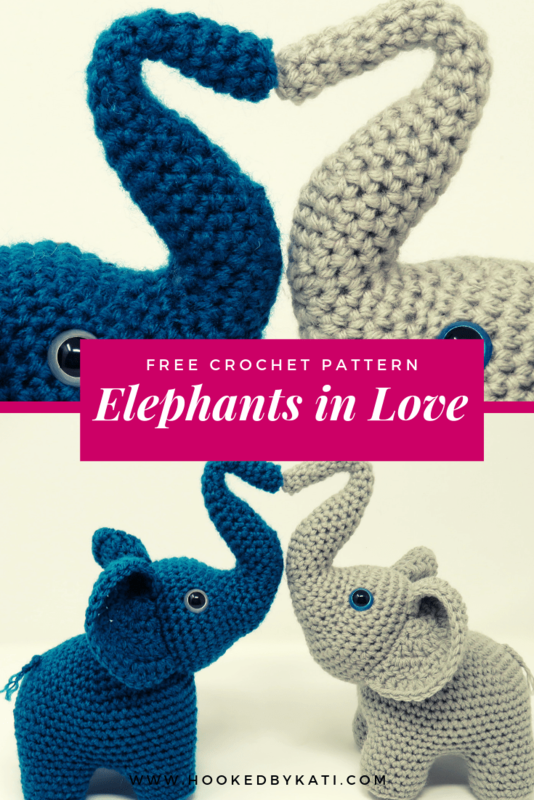 They would also make a great gift for someone who knits or crochets. 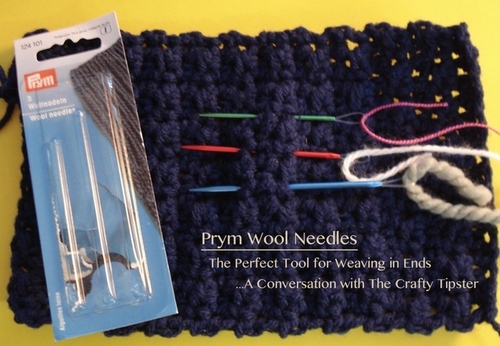 The Prym Wool Needles were also sold by Quilted Bear Ltd. You can find them – here.